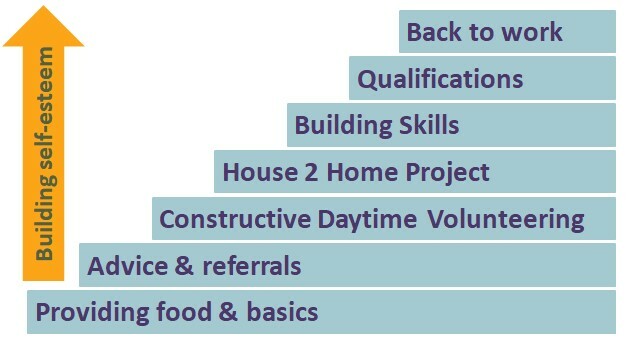 Helping Hands Community project helps people who are struggling with difficult situations including homelessness, addictions, unemployment, mental ill-health through our advice and support. When doing this, we process personal data about people who receive advice and support services from us – or provide us with support through campaigns, donations (in kind or financial), or volunteering. We are committed to protecting your privacy and take this responsibility very seriously. We therefore take care to safeguard it. This notice outlines what data we collect, how we may use it, how we protect your data and your rights, and how you can exercise those rights. References to ‘we’ or ‘us’ are to Helping Hands Community Project, registered charity no: 277354 (England) of 12 Gloucester Street, Leamington Spa CV31 1EE. From time to time we check this notice to ensure we provide you with up-to-date information regarding our data processing activities. We strongly advise you to read this policy from time to time to ensure you are happy with any changes that might be made. If you have any questions about this policy, please contact us using the details in the ‘Contact us, section. We sometimes also collect sensitive, personal data about individuals. This includes information about health, religion, sexuality, ethnicity and criminal records. We will normally only record this data where we have your explicit consent, unless we are permitted to do so in other circumstances under data protection law. For example, we may make a record that a person is in a vulnerable circumstance or other information to enable a referral, such as for drug rehabilitation or to comply with requirements under law. We will keep all your case information – including notes, letters and information given to us about you – in a confidential record that is specific to you. We use this information to support our advice, guidance and support. This means that we can keep the information you provide us, so we are able to see the history and relevant details of your case(s). This ensures that we provide appropriate and accurate advice or support. We take information security very seriously. No one is allowed access to our system or files unless they need this to provide the service to you, or one of the other purpose discussed in this notice. To ensure that our services meet a high standard of quality, client files are sometimes checked by our quality assurance staff. Files may also be checked by external auditors if the work we do is funded by another organisation, such as a local authority. All auditors are bound by confidentiality policies. We may use your data for statistical reports. These statistics will not include any information that could be used to identify any individual unless that individual has given specific consent, for example for a case study. We use a range of marketing activities and channels to contact our supporters – including our website, social media, face-to-face fundraising and email. We will obtain your consent to contact you by email to let you know about our activities, events, fundraising and relevant information about the vulnerable in our community. If you make any changes to your consent, we will update your record as soon as we possibly can. It may take up to 60 days for our systems to update and stop any postal communications from being sent to you. Where you have followed a link to unsubscribe from email communications this will, however, be stopped immediately. If you tell us you do not wish to receive marketing, fundraising or campaign communications, you may still receive transactional and service-based communications confirming and servicing other relationships you have with us (as described below). We are looking into registration with the Fundraising Preference Service so that you would also be able to opt out of receiving marketing communications from us by signing up to the Fundraising Preference Service. In addition to the fundraising and marketing communications that you receive from Helping Hands Community Project, we will also communicate with you by post, telephone, and email in relation to administrative and transactional matters. For example, we may call you after you have set up a Direct Debit to confirm your details, and upon cancellation. There may also be other occasions where we need to contact you about your donation – for example, if there is a problem with a payment or in relation to your gift aid declaration. We may create a profile of your interests and preferences, such as an interest to join a cycling fundraising team. This allows us to ensure communications are relevant and timely, to provide an improved experience for our supporters. When you donate or purchase an item from one of our charity shops, our online shop or the Gateway Café, we may collect certain information from you – including your name, address, phone number, email address, Gift Aid status, marketing preferences, and payment details – so that we can process your purchase or donation or contact you if we have any queries regarding your purchase or donation. Our website uses web beacons or pixels through third-party service providers that allow us to understand the activity on our website. When you apply for a job or volunteer position with us, your personal data will be collated to monitor the progression of your application, and the effectiveness of the recruitment process through the statistics collected. Where we need to share your data – such as for gathering references, obtaining a Disclosure and Barring Services (depends on the role) – you will be informed beforehand, unless the disclosure is required by law. These checks are only done after a position has been offered only to the successful candidate. On the application form, you are asked to complete the referees details, and can let us know whether you have provided permission to contact referees. Once you have taken up employment or a volunteer post with Helping Hands Community Project, we will compile a file relating to your employment or volunteer post. The information contained in this will be kept secure and will only be used for purposes directly relevant to your employment or volunteer post. Once your employment or volunteer post with us has ended, we will retain the file in accordance with the requirements of our retention schedule and then delete it from our files. We may collect data about professional contacts and partners with whom we work. Personal data collected in this way will be processed in accordance with data protection legislation and this policy. (e) Vital interests such as providing medical information if appropriate (for example if an emergency medic is called to site to treat a client and that information is relevant). Fundraising and Campaigning: including administering campaigns and donations, sending thank you letters, analysis, targeting and segmentation to develop communication strategies, and maintaining communication suppressions. Unfortunately, the transmission of information via the internet is not completely secure. Although we will do our best to protect your personal data, we cannot guarantee the security of your data transmitted to our website. Once we have received your information, we will use our procedures and security features to try to prevent unauthorised access. We encourage you to review the privacy statements of websites you choose to link to from the Helping Hands Community Project website, so that you can understand how those sites collect, use and share your information. We are not responsible for the privacy statements, security, or other content on sites outside of the website. We may use Microsoft Office 365 and other applications, which are a cloud services, for our internal office use. This means that internal documents and information generated by us are stored in cloud services hosted within the European Economic Area (EEA). Subject to the above, we will typically store data relating to donors and people who have taken campaign actions for approximately three years after their last donation or interaction, and people to whom we provide services to for approximately three years after completion of those services. Personal data about unsuccessful applicants are held for 12 months after the recruitment exercise is complete for that vacancy. If you request to receive no further contact from us, we may keep some basic information about you on a suppression list to avoid sending you unwanted materials in the future. Where we process your data based on your consent (for example, to send you newsletter e-mails), you can withdraw that consent at any time. To do this, or to discuss this right further with us, please contact us using the details in the ‘Contact us’ section below. If you have any complaints about the way in which we have used your data, please get in touch with us using the details in the ‘Contact us’ section below. We would be happy to help and discuss your concerns. In addition, you are also entitled to make a complaint to the Information Commissioner’s Office and the Fundraising Regulator.